The main advantage of a compost tumbler over a standard compost bin is the speed with which you can make finished compost. Typically, a compost tumbler will make compost in 6 to 8 weeks. Frequent turning by rotating the drum gets aerobic bacteria mixed through the organic waste, quickly working to break it down. The process happens even quicker if the composter is positioned in a sunny spot as the extra heat speeds up the composting process. For some gardeners, another advantage a compost tumbler has over a conventional bin is that since compost material is kept enclosed and up off the ground, pests are kept out. That allows you to be less selective about which kitchen scraps you add to the mix. The Yimby Tumbling Composter is hugely popular in the US and it’s now available in the UK. Everything about the Yimby is designed to make composting as quick and easy as possible. Deep sunken handholds in the composter barrel make rotating a breeze. These double up as deep fins which help break up clumps inside the chamber, stop compost from sticking to the sides and mix lots of oxygen into the compost. There are also adjustable air vents on the sides to get even more air into the system. The Yimby compost tumbler comes with a divider so you can split the drum into 2 compartments. The hatch has a ‘+’ on one side and a timer symbol on the other. The idea being that you add new organic waste to the ‘+’ side while you leave the timer side to cook down. The composter barrel is constructed from BPA free, UV inhibited recycled polypropylene. It is contact safe and will not degrade under direct sunlight. The galvanized steel frame is corrosion resistant. The Yimby is delivered flat-packed. The instructions are clear and easy to follow and assembly is fairly straightforward. The frame and side panels are fixed in place using in excess of 50 screws, so you do need to allow about one hour. You fix the side panels and the central divider in place first and then you add the panels one at a time screwing them in as you go. The barrel sits on a corrosion resistant, galvanised steel frame. Each compartment has a 70 litre capacity. If you have big garden or a large family and you produce a lot of green waste and kitchen scraps, then the Yimby will seem quite small. One option is to remove the divider and buy a second Yimby, so you can have one for adding fresh waste and one that you leave to mature. The Lifetime Compost Tumbler is a large capacity, heavy duty composting machine. Everything feels high quality and gives the impression it will hold up to years of consistent use. The single compartment tumbler turns on its axis, so even when full it’s relatively easy to turn. An aeration bar in the barrel mixes the compost as you tumble and gets your compost nicely aerated, which is so important for the decomposition process. The plastic panels are made from high density polythylene (HDPE) which has been UV protected for durability. The thick-walled, black construction is designed to absorb and retain heat to accelerate the composting process. You need a critical mass of material in there to really get it working, but once it’s at least half full, it gets really quite hot. Place the palm of your hand against the outside and you can feel the reassuring warmth of crumbly compost in the making. An extra large removable lid makes getting your finished compost out a breeze. A thoughtful feature is the spring-loaded pin that locks the rotation making filling and removing compost even easier. Full assembly instructions are provided including a list of tools you’ll need. The process is quite involved with over 50 nuts and bolts to screw in place, so expect to spend a good couple of hours. There’s also some straightforward drilling required through pre-prepared divots in the plastic panels. Lifetime provide the drill bit you’ll need. If you have a lot of garden waste and plan to make lots of compost, the Lifetime Compost Tumbler is a great option that will provide years of service. It’s also available in a smaller 246 litre and a larger 378 litre capacity. Some customers have complained about metal parts going rusty over time. We should add that on newer models, Lifetime have applied a more rust resistant paint to all metal parts. The assembly is quite involved with some drilling required, but the instructions are detailed and clear. The Envirocycle compost tumbler is a good looking unit, compact enough for a small garden or back yard. The innovative design allows liquid compost tea to gather in the base. The compost tumbler drum rotates on top of the base to create solid compost, while and the base allows you to collect the excess liquid from the drum as liquid fertiliser. Just dilute with water to give your plants a boost. It’s best to fill the drum to the top, then stop adding material when it’s full, while turning it 3 times, every 3 days to aerate and mix the pile. In the meantime, new compostable material should be added to a separate composter. Once the composting process is finished, simply roll the drum off the base to where you would like to use the compost. To get the compost out, you just remove the lid and take out as much of the compost as you can with a shovel. The drum, base and door are made from thick, BPA free, UV protected recycled plastic. The door is equipped with an eye-pin and hinge system, which combined with the shape of the door provide a reliable seal, keeping compost in and pests out. Nylon vent plugs allow air circulation to get into the composter, keeping the compost aerobic and speeding up the composting process. The Envirocycle makes composting easy and is a great addition to a small garden. It’s clean, compact and stylish enough to be positioned on the patio or terrace – you don’t need to hide this one away at the bottom of the garden. 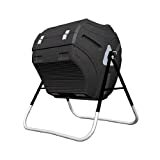 The composter sits on the ground rather than mounted on a frame like some other models. This makes it easy to get your compost out, but potentially vulnerable to being accessed by rodents. On earlier models, we heard stories of squirrels, etc, chewing through the latch on the door. Envirocycle have now replaced the latch with a toughened nylon version. 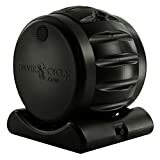 Plus, the plastic construction of the tumbler is thick and tough enough that only a very determined rodent would stand a chance of getting in. The Envirocycle is also available in pink, but given that the black version will heat up better and therefore make better compost in a shorter time, we would suggest you opt for the black. Draper, a family-run UK company has been selling high-quality garden tools for more than 90 years. Draper’s quality signature extends to this compost tumbler which uses a tumbling action to speed up the composting process. Just rotate the barrel every 2 to 3 days and if you have enough volume and your mix is right, you’ll feel the drum warm to the touch and you’ll have crumbly compost within a few weeks. It has a lightweight plastic construction and its symmetrical design means you can add your green waste at either end. It is held off the ground by a frame which has lock and pivot points and as the compost bin is off the ground, air and moisture are evenly distributed and pests are kept at bay. The composting drum has drainage holes around the top to allow any liquid to escape, so ideally place the tumbler on soft ground so the drips don’t stain the patio. If you have a small garden and you’re after a good quality, easy to use compost bin, the Draper Compost Tumbler is certainly worth considering. Some customers have said that the twist lids can be hard to open, especially if it’s been raining. When you use a compost tumbler, you don’t need a garden fork, pitchfork or aerator tool. Simply rotating the drum by hand does the trick. Rotating the tumbler mixes micro-organisms through the compost and gets plenty of oxygen into the system, speeding up the decomposition process. With regular turning and a good mix of organic waste, you can expect rich, crumbly compost in as little as 6 to 8 weeks. Even quicker if your composter is positioned in a sunny spot. How often do you need to turn a compost tumbler? For best results, aim to turn your compost tumbler every 2 to 3 days. It just needs 5 or so rotations to mix up the compost pile and get plenty of air circulating. The micro-organisms which are so important for decomposition need oxygen to survive, so regular turning speeds up the composting process.